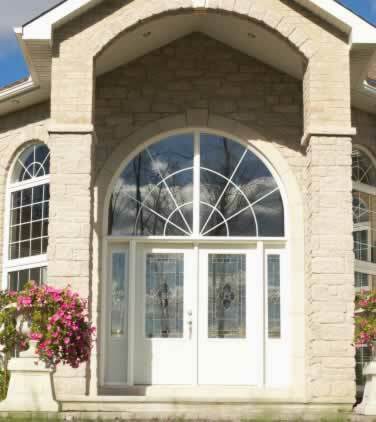 This grand entry is comprised of nested arches with a stunning glass transom and surrounding glass doors and windows. The faux brick architrave harkens back to gothic design, yet the design effect is neo-colonial and thoroughly modern in its materials. Classic French doors with exciting grille inlays prove that today's glass doors can be snug and energy efficient. Panel lites and expansive 16-panel double-hung windows echo the theme of the glass doors, surrounding the home with bright opulence. Double-glazed windows and glass doors can help cut down your utility bills while adding value to your home. Coatings, visible in the arched transom windows, help block harmful rays from your interior furnishings. The sum of the parts is simply magnificent. And the glass doors and sills are surprisingly easy to maintain.